Noble Prince continued the Irish celebrations at the commencement of St Patrick’s Day with a four-length victory in the Jewson Novices’ Chase, to give Ireland a record-equalling 10 Festival victories and bring up jockey Tony (A P ) McCoy’s 200th winner this season. The Paul Nolan-trained seven-year-old jumped superbly throughout and leapt into the lead at the final fence before storming clear up the hill from runner-up Wishfull Thinking. 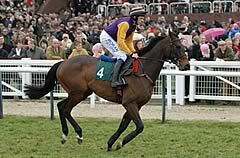 Nolan, whose previous Festival success came in the 2005 Fred Winter Juvenile Handicap Hurdle with Dabiroun, said: “That was a super ride from Tony and super from the horse - he came up when he was asked and he was fantastic. “The horse jumped great and there are no excuses in the race. It was a proper race and he needed to jump - it was a great race. Even when he was just beaten by Realt Dubh at Leopardstown, I knew he would be better on better ground. His form is rock solid and he is nice and consistent. “This trip seems to suit him. 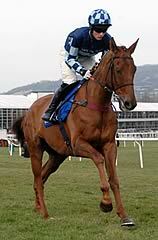 He hit a few flat spots and would have been struggling in the Arkle on this ground. He never missed a fence and if he had we’d have been in trouble. He was brilliant and A P was brilliant. “I knew Tony was available a couple of days ago. “Since Dabiroun, we’ve had a few disappointing runners and some long faces here but we’ve laid that to rest. It’s just great to be among the winners and one of the best feelings of my life. Philip Hobbs, trainer of runner-up Wishfull Thinking, said: “We just found one too good but he ran a good race and with Captain Chris winning the Arkle we were certainly justified in going for the separate races with them. Third-placed Loosen My Load gave his connections another tremendous run after his stablemates Sizing Australia and Sizing Europe won on Tuesday and Wednesday respectively. The trainer, who has his fourth and3 final runner of the week, Queiros Bleu, in the Pertemps Final, also reported that yesterday’s sportingbet.com Queen Mother Champion Chase winner Sizing Europe seemed fine this morning after his exertions.